How lucky it is that, no matter how busy we might be, there always seems to be time to squeeze in a spot of cookie baking at least once (or sometimes, twice) in a week. The quick, unfussy kind of drop cookie, you know, that requires nothing more than mixing up some ingredients, scooping the dough onto trays, and a fifteen-minute stint in the oven. For the longest time, this weekly cookie baking meant pulling out my mother’s world-traveling oatmeal-chocolate chip-walnut cookie recipe (I’m not exaggerating: these cookies have been shipped to college campuses in Georgia; in care packages to Saudi Arabia and Kuwait; and served to countless numbers of military personnel who passed through the Spanish airbase we were stationed at, enroute to Kosovo in 1999), and we still make them whenever we’re in the mood for an oatmeal cookie. 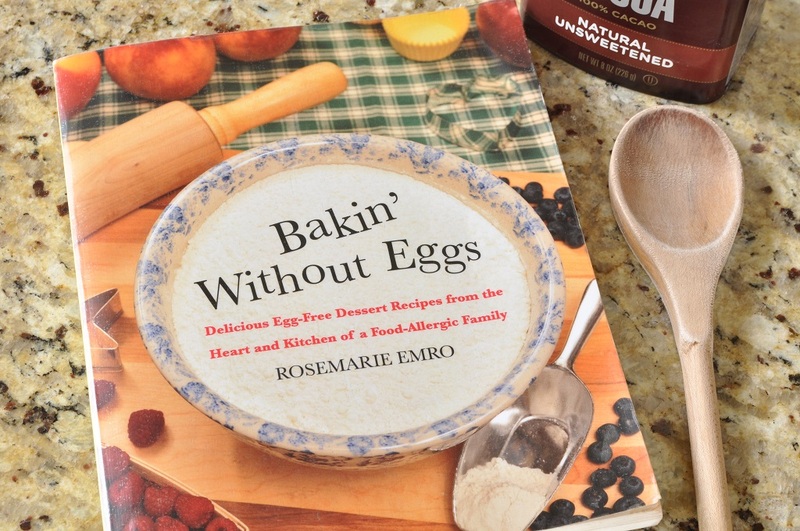 But right after my mother learned that she was allergic to eggs, we bought a delightfully helpful cookbook, Bakin’ Without Eggs, fell in love with one of the chocolate chip cookie recipes in it, and have been making them ever since. As it contains no egg, you can eat as much dough as you like. It is infinitely adaptable, so you never get bored. I’ve made versions ranging from ones that are practically identical to the original, such as chocolate chip-sour cherry, to ones that bear almost no resemblance, such as toffee-cream cheese swirl blondie cookies. Of course, eight out of every ten times, we stick with the chocolate chip originals because it honestly doesn’t get much better than that. However, one twist that I love to include, in all versions of the recipe, is the addition of a few tablespoons of cocoa powder, just to intensify the chocolate flavour a bit. Here is the version I made most recently, a double-chocolate cookie (chocolate chunks and cocoa powder) with rice crispies for crunch. I suppose I ought to apologize for the number of chocolate cookies I feature here, but after all, is there really such a thing as too many chocolate cookies? And it says a lot about the appeal of this recipe, that, after testing two or three recipes per day all week, my idea of relaxing on the weekend was making these cookies. Or maybe it just says something about how much I love being in the kitchen . . .
Laura of I’d Much Rather Bake Than . . . is asking for our favourite recipes for this month’s Biscuit Barrel Challenge, so I’m definitely sending these over. I also used local butter from my Pennsylvania Dutch farmer’s market in these cookies and am submitting them to the Shop Local challenge headed by Elizabeth of Elizabeth’s Kitchen Diary. You might think that no one could possibly taste the flavour of the butter, what with all the chocolate and brown sugar and vanilla in these cookies, but it really does come through. Good butter is a must! Finally, I noticed at the last minute that the letter for this month’s Alphabakes challenge, run by Ros of The More Than Occasional Baker and Caroline of Caroline Makes, is “E,” which means that my “everyday” chocolate cookies can be shared there as well. Ros is hosting the challenge this month. In the bowl of a stand mixer fitted with the paddle attachment, cream together the butter and sugars on medium speed, just until smooth. Add the vanilla, oil, and 1 tablespoon of the water. Mix until well blended. Scrape down the sides of the bowl and let the mixture stand for at least 10 minutes (this helps develop beautiful butterscotch-y notes in the end taste). 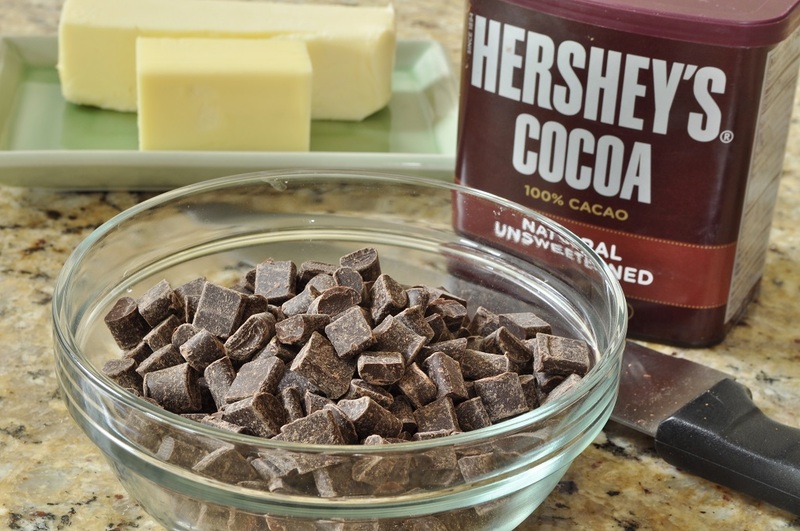 Add the flour, cocoa powder, and baking soda. Beat on medium speed until the dough is evenly mixed. If necessary, add the remaining tablespoon of water. The dough should be soft and a bit sticky. 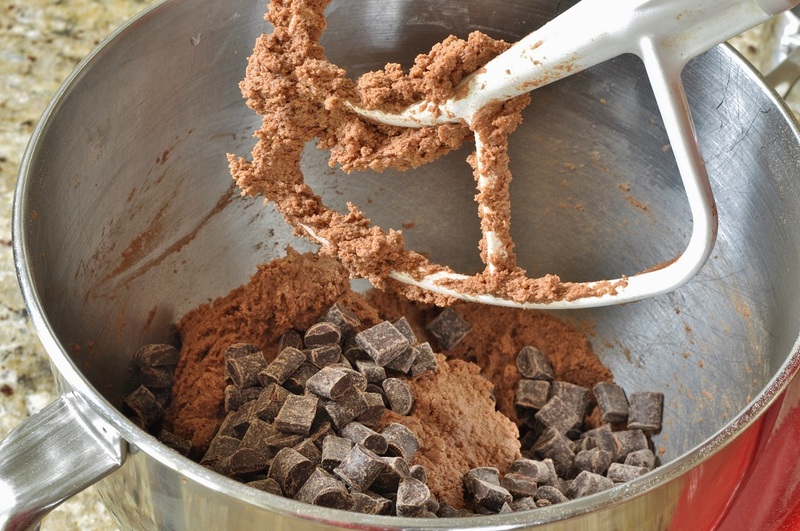 On low speed, mix in the chocolate chunks. Using a wooden spoon, gently stir in the rice crispies by hand. Only mix enough to distribute them evenly throughout the dough, as you don’t want to crush the cereal. 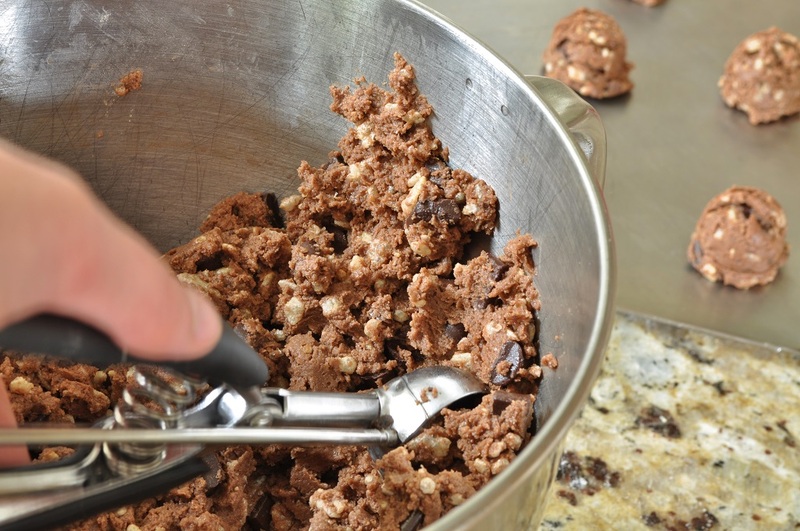 Portion the cookie dough onto ungreased sheet pans with a small cookie scoop (2-teaspoon capacity), spacing 2 inches apart. Bake until the edges of the cookies are set but the centres are still soft, 10-13 minutes. Allow the cookies to cool for 5 minutes on the trays, and then remove them to wire racks to finish cooling. 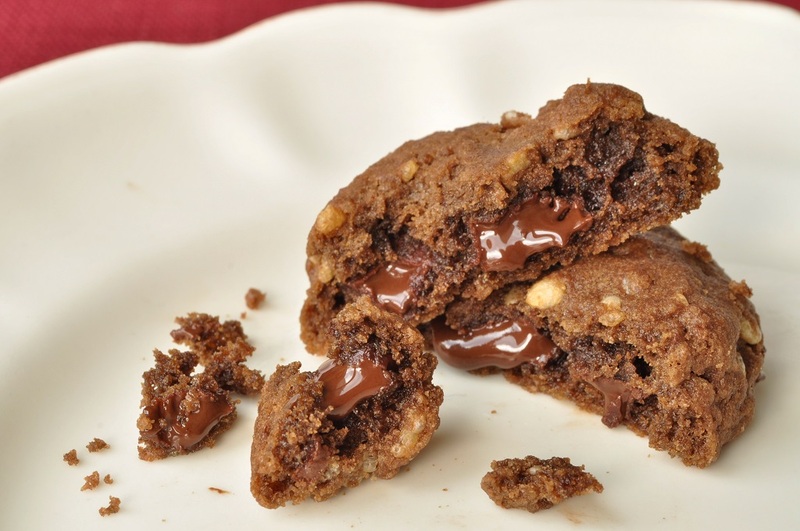 I actually find that making cookies without eggs lets the flavour of the other ingredients shine through–a very good thing in a chocolate cookie! Nothing! 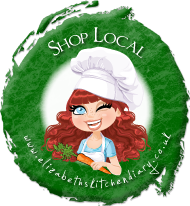 Especially if they’re made with luscious local butter . . .
You can never have too many chocolate cookies! These look absolutely amazing and I like that it contains no eggs. I’m bookmarking this to try and I can already think of a few variations for this recipe. Thanks for entering AlphaBakes. I’d love to hear your ideas for variations, Ros. If you ever blog about one, be sure to send me the link! I will definitely link back to your page when I blog about it. I want to make these cookies with peanut butter chips or mint chips or butterscotch chips and experiment with other textures like cornflakes and oats. Ooh, a version with mint chips would be so good! And I think cornflakes is a great idea, too. I make variations with oats all the time, but I’d like to try some other cereals as well. Cereals are very underrated baking ingredients! Mmmmmmmm………….. Need I say more? These look so inviting. And no…. 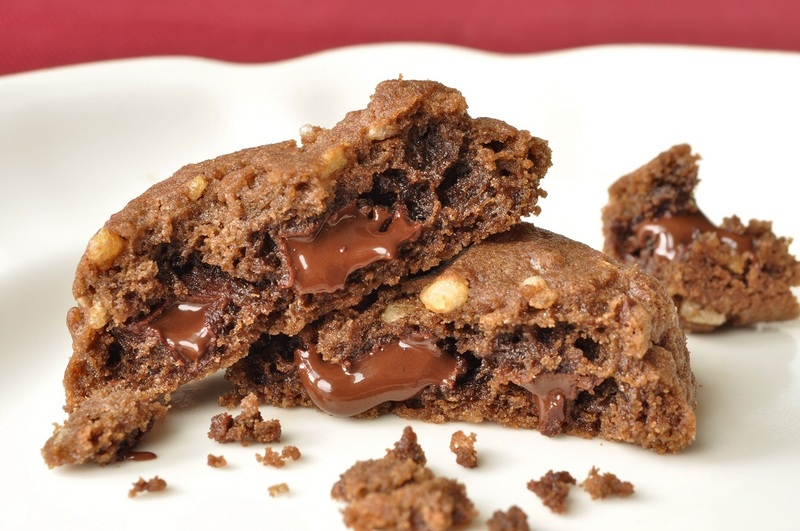 you can never ever have too many chocolate cookies, especially when they look as delicious as these! Thank you, Kate. 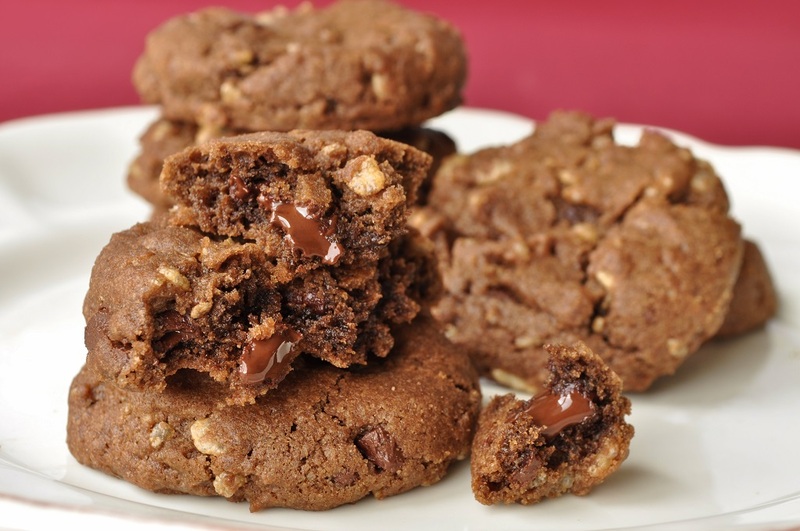 There have been many chocolate cookies in my life–and I suppose there will be many more!